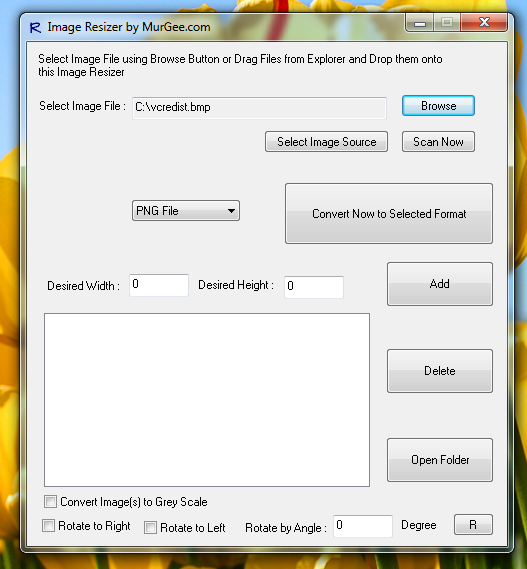 Looking to resize file size of a jpg, jpeg or any other image file ? This post has a solution for reducing image size for Windows users. The file size of a image file or a picture can be reduced by degrading the quality of the image or by resizing it to other suitable image size. In case you have captures images from your high resolution mobile or digital camera, would you like to reduce the quality of the image ? Yes that does not sounds like a great idea, however the Image Resizer software presented here has got an alternative for you. Instead of reducing the quality of the image, reduce the image size. In case you have captured high resolution images with a let’s say 5 Mega Pixel Camera, or even a digital camera with 10 Mega Pixel or may be more, one thing to understand is that the image size in pixels can be very large as compared to your display resolution. Peek into the file properties and find out what’s the size of the image in terms of pixels. In case it is really large , the Image Resizer software can be helpful to reduce the picture size and in turn picture file size on the disk. Reducing the Image Size will in effect reduce the file size of the image or picture file. In case you do have multiple still pictures captured using a Digital Camera or Mobile Camera, and you want to send the files by email, this option of reducing the image size can really make the things fast. When you resize the images using this Image Resizer, the original images remains with the old sizes and new files are created with reduced image sizes. Download the free trial of Image Resizer, install it on your Windows 8, Windows 7, Vista , XP or any other Microsoft Operating System to reduce file size of multiple pictures easily and quickly.